Wool Jute Cushion Cover, Size: 16*16", 18*18"
We offer an exclusive range of Woolen Cushion Cover on at unmatched quality and market leading prices. They are manufactured using advance and latest techniques. The Cushion Covers provided by us are highly acclaimed for their enhanced visual appeal. These covers look aesthetically pleasing and stylish. We are offering our clients a very elegant and different range of Wool Cushion Cover. These cushion covers have very attractive designs. 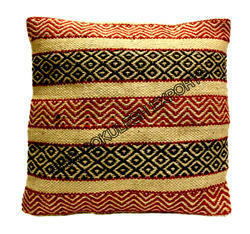 We are also offering the set of three, four, five, six etc cushion cover to our clients as per their requirement. They are available at a pocket friendly price. These cushion covers are stylish and comfortable. 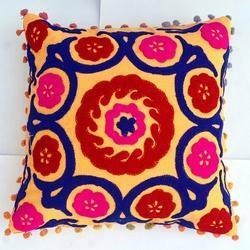 These 100% Cotton embroidered cushion covers are made in natural cotton fabric. The woolen embroidery gives an artistic and premium touch.